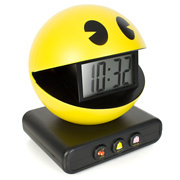 Battery operated, this eye-catching Pac Man alarm clock features Snooze, Alarm Off and Backlight buttons represented by cherries, a bell and naughty ol’ Pinky – and if that particularly 80s name means nothing to you, there’s little point telling you about our other recurring dream involving Gorf, Duran Duran and Kim Basinger. Wakka-wakka! There's nothing like waking up to the iconic Pacman tune to set you up for a day of work and eating ghosts.